Let’s be familiar with Solar fence Energizer product. Understand the basic features and applications of Fencing and why you should use it? What is Solar Fence Energizer? The farmers need to save their crop from unwanted nuicences and farm animals. In India, to protect our land and farm we can not use normal electrical equipments, because in remote areas electrical current isn’t readily available. Plus, No on-going costs for electricity or replacement batteries. As solution to this problem, Wiptech has developed a Solar Fence Energizer product called ‘VIMOX ‘, which protects your land and crop from unwanted nuisances. 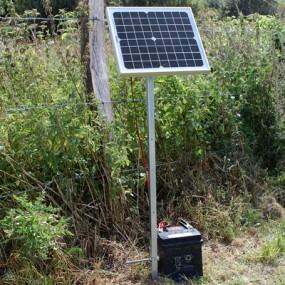 In a solar electric fence charger the battery contained in the unit is continuously charged by the solar panel and is virtually maintenance free. Solar powered Fence energizers have the advantage of portability over AC units and are great for containing animals in remote locations. A Solar Powered Unit requires less maintenance than a regular DC (battery) Operated Unit. The Solar Fencing which we manufacture has been made using a high quality of raw materials and they have a very robust make. Our Solar Fence Energizer have been priced at reasonable rates in the market and they are high on demand in the market for protecting the area from thefts and from stray animals. 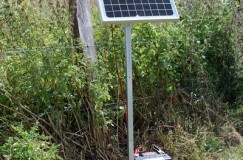 Power outages will not impact the solar powered fence charger’s ability to keep your land safe. 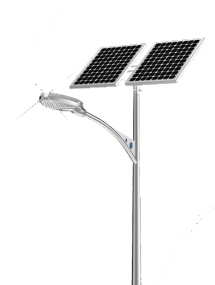 Wiptech’s environmentally friendly solar power product helps conserve energy usage. Wiptech manufactures and supplies Solar Fence Energizer product. Animal which comes in contact with the solar fence while trying to enter the field receives a painful but safe shock. VIMOX Solar Fencing is not only a physical barrier but also a psychological barrier preventing animal intrusion. Wiptech manufactures, supplies, installs and services systems in its entirety including energizers, spares, wires, insulators, fences posts, tools and accessories. All components are fully tested and meet national and international standards. 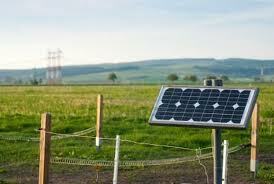 How does Solar Fence Energizer Work? Wiptech is one of the leading manufacturers of Solar Fence Energizer manufacturer in India (Western part). Contact us for More details.